Last July, after 58 years of business, Indianapolis’ Double 8 grocery chain closed the doors on its four remaining stores, leaving many in the city’s low-income neighborhoods north of downtown stranded in a food desert. When she saw her regular store shuttered that hot July morning, Thomas wrote a note on a scrap of paper, offering rides to anyone in the neighborhood who needed to get to the grocery store, with her contact information. She didn’t have any tape, so she used the gum her daughter was chewing to stick the note on the door of the dark grocery store. Mapleton Fall Creek is not an anomaly in Indianapolis. WalkScore.com ranked Indianapolis last among major U.S. cities for access to healthy foods, with only 5 percent of residents living within a five-minute walk of a grocery store. According to Feeding America, the nation’s largest domestic hunger-relief organization, 19.4 percent of Marion County — which is mostly made up of Indianapolis — faces food insecurity, compared to the national average of 15.4 percent. Indianapolis Mayor Joe Hogsett made food insecurity a key issue in his campaign last year. In his neighborhood development plan, his biggest promise for addressing food insecurity was the appointment of a full-time staff member dedicated to the issue. In the coming weeks, Mayor Hogsett is expected to hire a food policy and program coordinator, who will work under the director of public health and safety in the mayor’s office. The coordinator will be responsible for raising awareness of and identifying solutions for the city’s food insecurity crisis. As lawmakers at the state and federal level push for legislation to address food deserts, the biggest challenge for the incoming coordinator will be to unify the patchwork of community-based initiatives that have cropped up across Indianapolis over the years in response to the issue. When the Double 8 grocery chain closed in his home district, Democratic U.S. Rep. André Carson took notice. “The Double 8s were nothing to cheer about,” he admits. The floors were dirty, the meat was not always fresh, and the customer service was subpar. But, he acknowledges, the grocery chain kept many low-income families from living in a full-blown food desert. Carson met Maxine Thomas through her work with Results, an anti-poverty advocacy group. Her stories about giving rides to neighbors after Double 8 closed inspired Carson to take action. In March, Carson introduced the The Food Desert Act, which seeks $150 million in federal funds for low-interest loans to support existing or proposed grocery stores in food deserts. To be eligible, stores would be required to sell staple foods and healthy options in underserved communities. Earlier this year, Republican State Senator Randy Head introduced a similar bill in Indiana’s General Assembly. The bill requested $1 million from the State General Fund to establish a grant program to support new and existing grocery stores that sell fresh, unprocessed foods in food deserts. Both pieces of legislation face their respective challenges. The Indiana General Assembly wants to see a comprehensive study of food insecurity in Indianapolis before approving a grant program, and Carson’s bill faces long odds in the Republican-led Congress. To promote greater availability of healthy foods in Indianapolis, the new food policy coordinator’s best resources will likely come from the bottom up, not the top down. Food banks and food pantries serve a crucial role in providing healthy food options in Indianapolis. Midwest Food Bank is one of the largest suppliers of food donations in the state, serving between 80,000 and 90,000 residents per month — more than half of whom lives in Indianapolis. Midwest Food Bank donated nearly 6.8 million pounds — or $13.5 million worth — of food last year to Indianapolis, but demand continues to rise. Transportation is a key element of food insecurity in Indianapolis. The U.S. Department of Agriculture’s Food Atlas Research Map shows large swaths of low-income areas in Indianapolis that have poor access to grocery stores, poor access to vehicles, or both. The lack of public transportation further compounds the problem. Using data from the National Transit Database, FiveThirtyEight ranked Indianapolis’ public transportation last among U.S. cities with a population over 1 million. Low-income residents in Indianapolis, as in many cities, heavily rely on public transportation. The median income for commuters who use public transportation in the city is $16,643, whereas the median income for commuters who drive is $30,349. Nearly 20 percent of commuters using public transportation live in poverty — about twice that of commuters who drive. City officials have been pushing plans for a rapid bus loop, which would significantly improve mass transit, but construction has yet to begin. According to Schaffer, part of the incoming coordinator’s roll will be to help expand access to transportation for low-income residents in food deserts. For Christine McMullen, improvements to the city’s public transportation could not come soon enough. After the Double 8 in her neighborhood closed, she would lug her big red suitcase to the bus stop at Meridian and 34th Street to go grocery shopping. “If I’m going to go to a Kroger or Aldi, I have to take two buses,” she says. During the week, the round-trip takes about two hours. On the weekend, when buses run on an irregular schedule, it can take up to four hours. To supplement the lack of reliable public transit in Indianapolis, alternative transportation options have emerged over the last few years. Their internal 2015 data show that among users of the bike-share’s program designed for low-income residents (which charges $10 per year for membership), 25 percent of trips ended at one of two docking stations located next to a grocery store. But the system only services the downtown area, and carrying items like groceries on the bikes can be a challenge. BlueIndy, an all-electric car-share service in Indianapolis, is currently developing a program to address food insecurity. The company is evaluating the construction of BlueIndy stations at Kroeger grocery stores in food deserts and is in conversation with several building management companies about constructing stations near low-income complexes. “If there’s a way that we can assist people living in a food desert [to acquire] fresh, healthy foods, that’s our goal,” says Lance Boehmer, marketing manager at BlueIndy. But BlueIndy also has its limitations. Memberships cost about $10 per month and additional fees apply for every ride. While the company initially promoted the car-share service as “an expansion of public transit,” the first stations were constructed in areas with high economic activity. This was seen by some as an effort to recoup investment of taxpayer dollars in the controversial public-private partnership between the city and BlueIndy. Today, few of the existing 74 stations are located in food deserts. The company, however, is currently considering 250 locations for the final 100 stations and, according to Boehmer, over half of the potential locations are in food deserts. 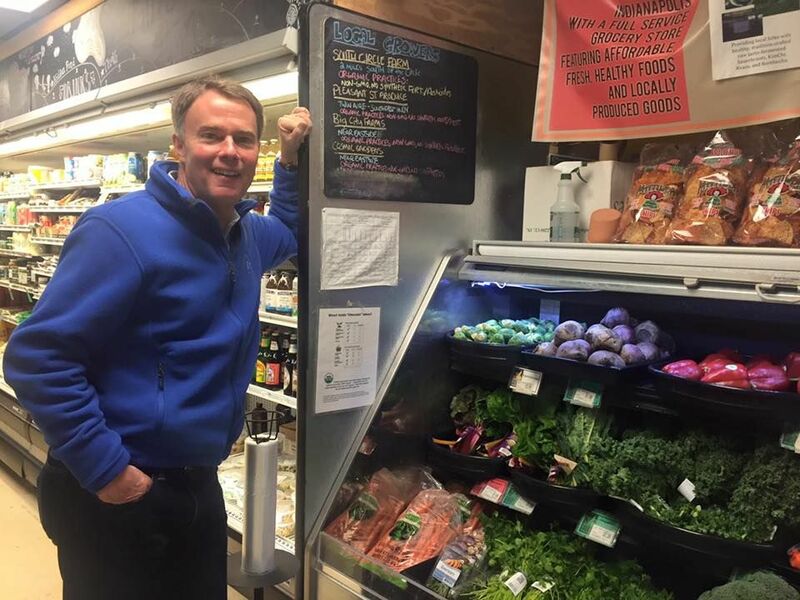 Since he launched his campaign in late 2014, Hogsett expressed confidence that Indianapolis could overcome its food insecurity crisis. The most significant challenge, according to Schaffer, will be to unify the efforts across the city to the same goal. And it’s a challenge on which the mayor is willing to stake his legacy. “Raising the level of awareness and the resources when it comes to tackling these systemic issues will [ultimately] come to define this administration,” said Schaffer. Scott Rodd is a D.C.-based freelance reporter whose work has appeared in the Washington Post, the New York Observer, Think Progress and Salon, among other publications.